lavenderview | Come Meet Our Family. The smells this time of year at the farm are just incredible! Even as I sit at my computer, I am surrounded by hundreds of hanging bunches of lavender that fill the room with calm. My infant grandson slept in this room last week and slept through the night! Never underestimate the power of aromatherapy! 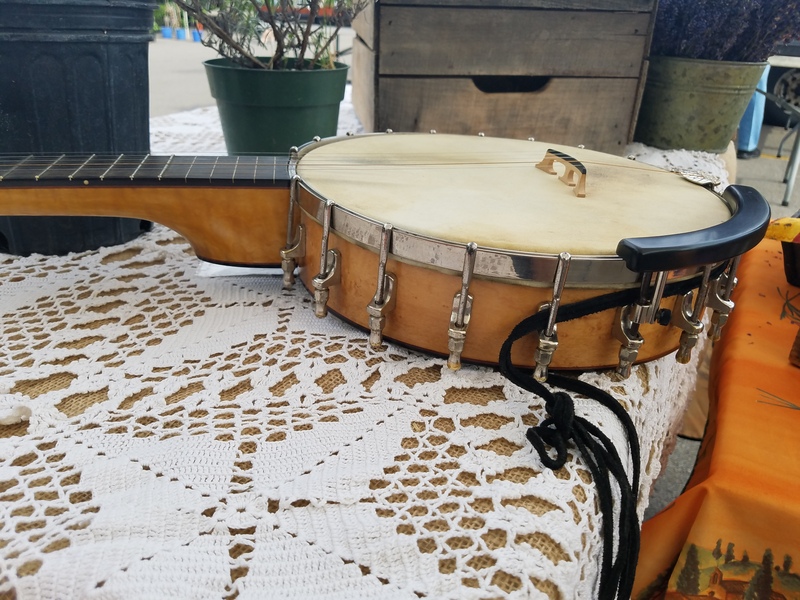 May and June of 2017 found us at the Fairport Farmers Market on Saturdays 7-12. If you haven’t been to this market, it is a special blend of produce, flowers, and vendors – We always end up spending some of our profits on amazing baked goods and breads, locally grown fruits and veggies, local flowers, and special crafts and homemade items. We will have a varied schedule in July and August, and then be back to every Saturday in September and October. Whether we are there or not, we hope that you support the Fairport Farmers Market! Corn Hill Festival was this past weekend and so much fun!!! The weather cooperated nicely and we nearly sold out of many of our products! Talk about smells- SO many people told us that they smelled our booth before they found us 🙂 The fresh bunches of lavender, cut the night before, plus our soaps (we certainly don’t skimp on the essential oil! ), brought a large crowd to our booth. Thanks everyone!! Park Ave Festival is up next!! Soap making is in the process, distilling tonight, and always cutting and drying lavender….the stress of running your own business is certainly reduced by the smell of lavender wafting through the air 🙂 I am definitely too blessed to be stressed! Park Ave is August 5 and 6 and we will be set up between Buckingham and Argyle. Hope to see you there!!!!!!! And… in the midst of all this fun, we are awaiting the arrival of our 11th grandchild!!!! Life is good:) Just going to breathe deeply and enjoy…you do the same! We’re looking forward to an early start. Fairport market on May 5th, 250 seedlings arrive the first week in April and we have last year’s plants in a greenhouse that have started to grow. 6 batches of soap aging in the basement that are good enough to eat. But lets not get too excited, so much can change, and the weather tops the list. We are excited about some of the product improvements last year. Look for our page on products to learn about the ingredients. The family? So much new there. Babies, weddings, we are blessed. Our plan again this summer is to open at Fairport, then take a break from there while we gear up for Corn Hill and Park Ave. Open house this summer? TBD. Yes, this is a new website format. The English Lavender is now coming into bloom. For dried flowers, you will want to pick pretty soon. They get cut just before the tip opens up! That will give you the maximum amount of color. We will try and cut this week, probably around the 24th or so of June. We officially opened up the season at The Fairport Farmer’s Market on May 2nd . The winter was good to us. We were been blessed with a new grandson, our 7th Carter and the heavy snow insulated our lavender. We had minimal losses in the fields but did lose all of our plants overwintering in the garage. That was Ken’s fault. We are still clearing out some of the dead brush from last year, and certainly the weeds are back in full force! 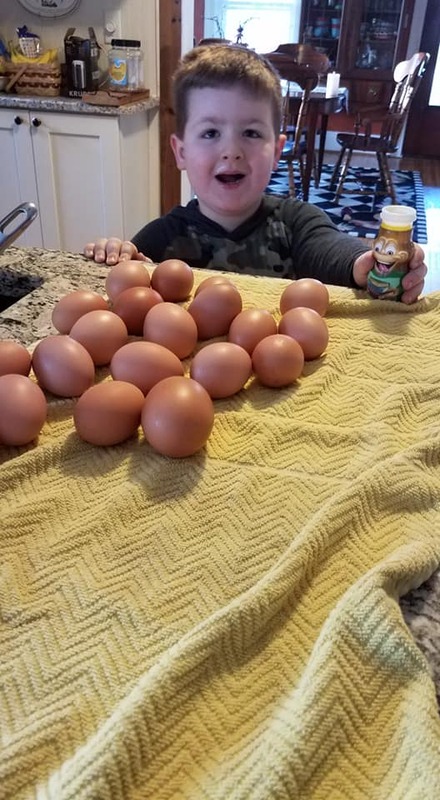 Yes, this spring we did lose all of our chickens, 9 of them in one night. We are still interrogating the resident foxes and coyotes to see who will own up to it. Corn Hill on July 11th and 12th, and Park Ave on August 1st and 2nd. New Products have hit the stand! We have a shaving soap just in time for Father’s Day, and have a new formulation for our massage oil that seems to be a hit as a moisturizer. It’s replaced our lotion, which we are still having difficulty making. Has Connie lost her touch? We’re still thinking about new products and formulas. Some new packaging is expected for Corn Hill. Send along an idea if you have one. We dried off our two does, Genka and Geneva in late August just before school started. Sure, it was pretty easy and fun getting up at 6 every morning, and milking at 6 every night. No big deal, except when you are out doing something and have to get home, or want to sleep in and have to get up, or want to go someplace like a cottage in Canada, EVERY day 2X per day. But the milk kept flowing, one gallon a day, every day, and we made cheese every other day. Oh yes, I forgot , we have jobs. Jobs that actually pay the bills. Can’t make money solely off of goat milk at this scale. So, we dried off the girls, without event, a lot of noise though, but it worked out well. Thank you to Connie for working out the schedule. Right now, we’ve decided to take a break and not breed for next spring. 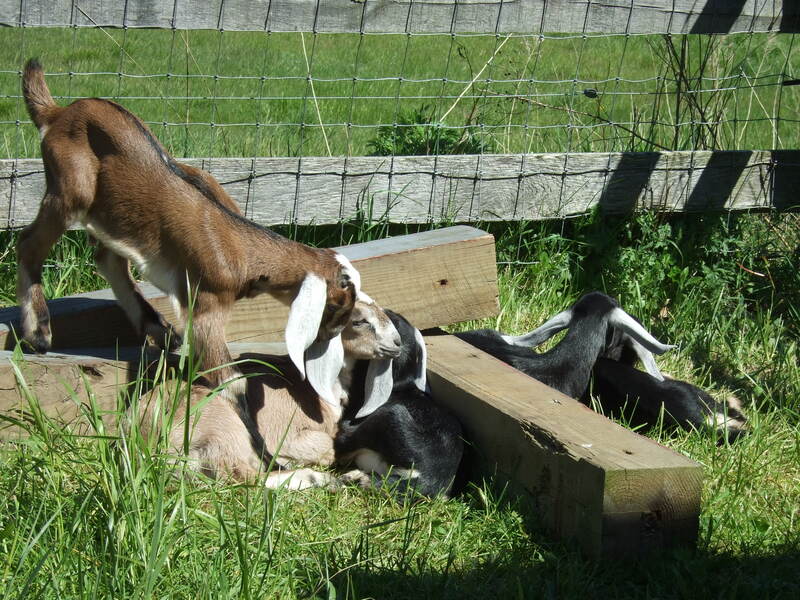 We’ll breed next fall but eventually we will have to figure out what to do with the surplus of goats. As of now we’ve got 7 goats, eating hay that’s gone up in price due to the drought. We’ve stocked up multiple times, at the suggestion of the local farmers, and the final amount should be enough for the winter. Our goats often don’t even go out to pasture during the winter. A little rain as well? Forget it, the barn is nice and cozy and they give me food. We cut back on their feed to force them out which ended up giving Daisey ( one of the triplets) goat polio. Most likley due to the switch in diet. So, now we feed them pretty much when they want to eat. When it’s sunny, they go out in the pasture and feed. Goat Polio? Connie and I are off to a reunion dinner one night, and just before heading out I check on the girls (the goats I mean). Daisey is walking funny and is stiff in her back legs. Within about 1/2 to 1 hour, she can’t walk, goes blind, and has some serious convulsions. Yes, I’ve said some prayers for her, and fortunately given her a shot of B Complex vitamins just in case it’s polio. But what do I know. My Goats for Dummies manual doesn’t quite give me all the answers. 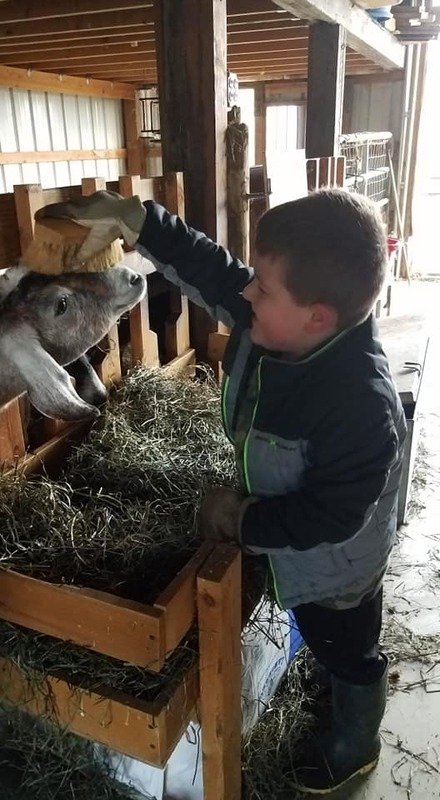 Goat Polio happens when a goat’s rumen ( one of their 4 stomachs) get’s out of balance and stops breaking down cellulose. They go into vitamin B deficiency and that impacts their nervous system. Our vet was at a conference, and we didn’t have time to do anything else. It turned out to be the right thing to do. After a few hours, she was back up, strutting and prancing around. After more 3 days of treatments, she was okay. Now we’re enjoying taking walks with our herd. I’m dreaming about the life as an artisan goat cheese maker, with a barn full of nubians and a cheese house, and Connie’s dreaming about me getting something else done around the place that doesn’t involve being out in the barn. Our Girls, Genka and Geneva are blessing us with about one gallon of milk every day. That will make over 2 pounds of cheese every day! 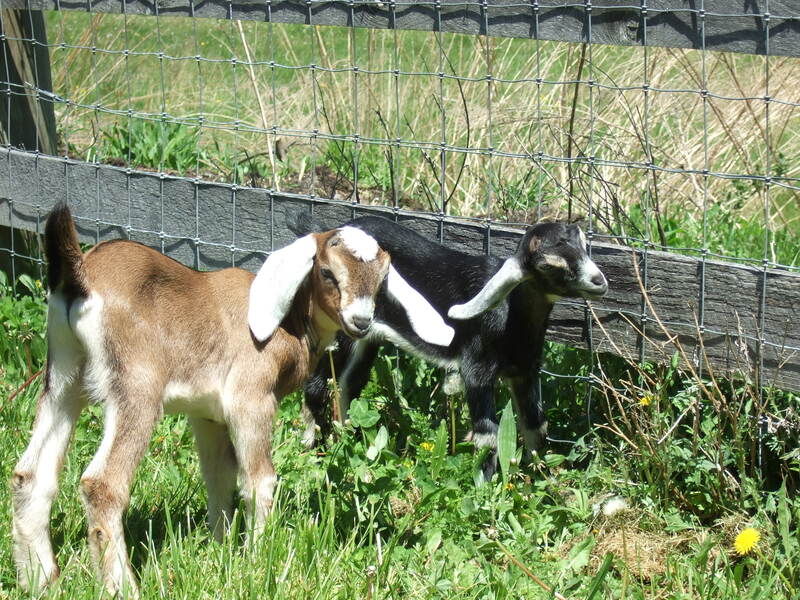 Our Nubians are young, healthy, and yield just the right stuff for cheese. So far, we’re just making Chevre, eating it and freezing it. Later this week, we’ll be trying some Feta or Cheddar. It’s fantastic stuff. 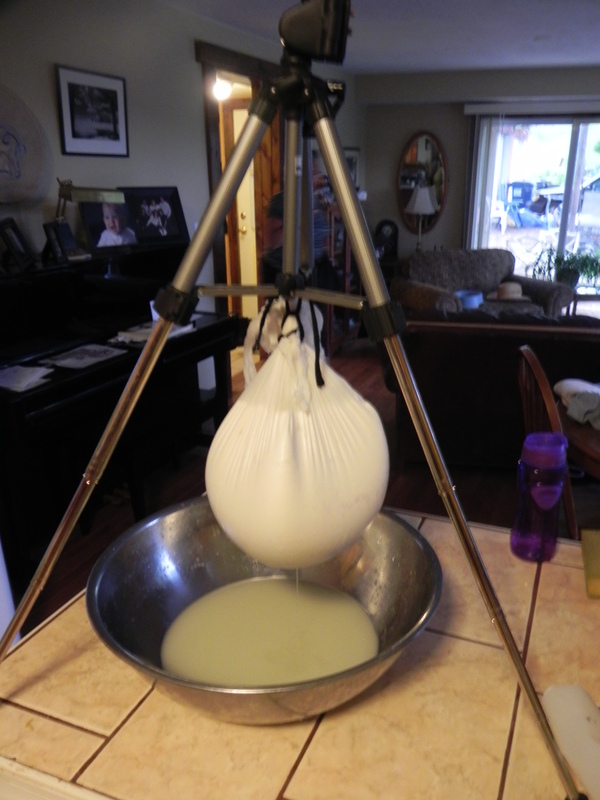 Chevre takes about 24 hours to make: 12 hours to sit at room temperature and 12 hours to drain(seen below). It did,initially, make me nervous to grow bacteria in the kitchen , but that’s how cheese is made! With high quality milk coming in, and attention to cleanliness when milking and making the cheese, we’re comfortable using the raw milk. It was interesting to hear NPR did a short clip about the benefits of raw milk a short while ago. State regulations prohibit us from selling the milk or cheese though, which is kind of disappointing. Although, I’ve seen some dairies first hand and can appreciate why there are such regulations. For us, it’s too expensive to comply with them. Oh well, we’ll just have to enjoy it ourselves! 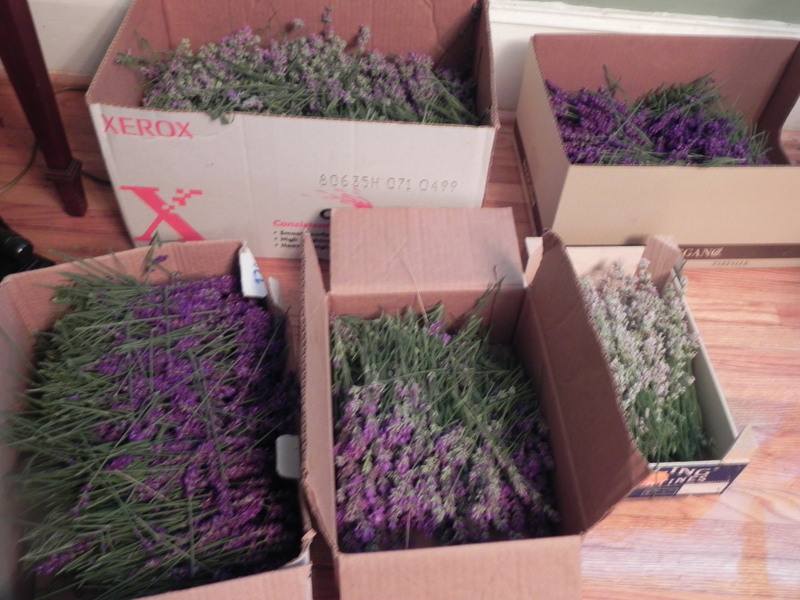 The lavender is coming in, bundles and bundles. The English Lavender, pictured below, is almost through, and the French is coming on strong behind it. This went for bundles sold at the market. Remember, the English is better for drying and the French is typically larger, and more fragrant. We’ll be running the still this week, making oil and more importantly “Eau de Lavande “. Our floral water. We’ll try both types of lavender in the still. The distillate is all natural, and I think a “signature” product for us. The still should be up and running on the 4th of July for the first time this year! No open house, at least for now, but drop us an EMAIL if you like. 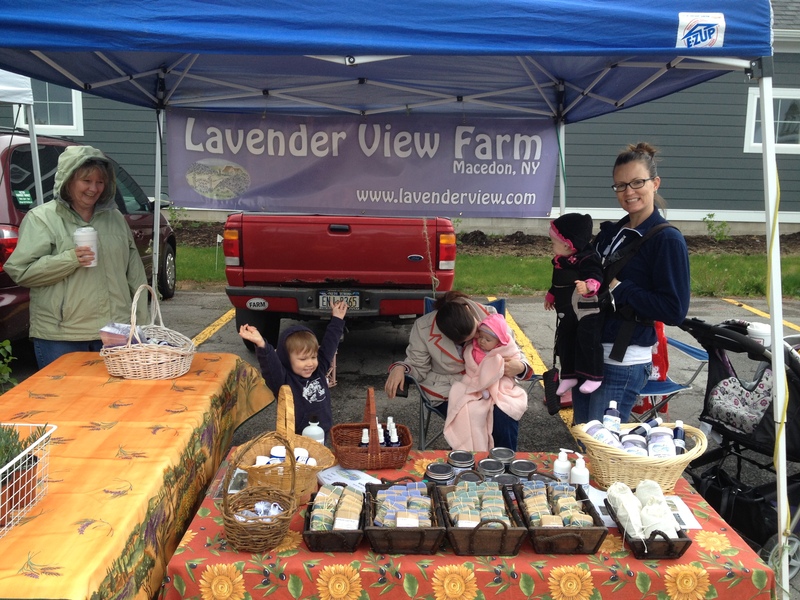 We’ll be back at the Fairport Market, Saturday mornings, starting on July 14th, with plenty of lavender too! We’ve spent three weeks at the Fairport Farmers market on Saturdays from 7 till noon. It’s a great place to bring the family and meet and make new friends. After 3 weeks, we’re almost sold out of products. Soaps take about a month to age, so we’ll be fully back into soap sales in mid June. As usual, we’re pricing our products at a very attractive price. Yes, we have the best soaps around, and the other products are great too. Eau de Lavande? Still some left. Even though we can sell products at the market, our material and production costs are so high, that there is virtually no return. Labor? It’s free. How do these full time farms do it? Can’t pay the bills. Don’t think I’ve hardly ever paid $4 for a bar of soap, but now that I know whats in it, maybe a different story. That goes for milk and everything else coming off the farm: under priced and under paid. Lavender plant sales have been strong, and our plants are very healthy. These plants were left over from last year. We lost about 40% that we overwintered in the garage, due to lack of watering I think. The ones that survived, have been growing well. Recently I’ve started to slow them down and need to repot them. Price will go up soon. The new lavender planting have taken hold this year. They like the dry weather. Recall last year, it was very wet. 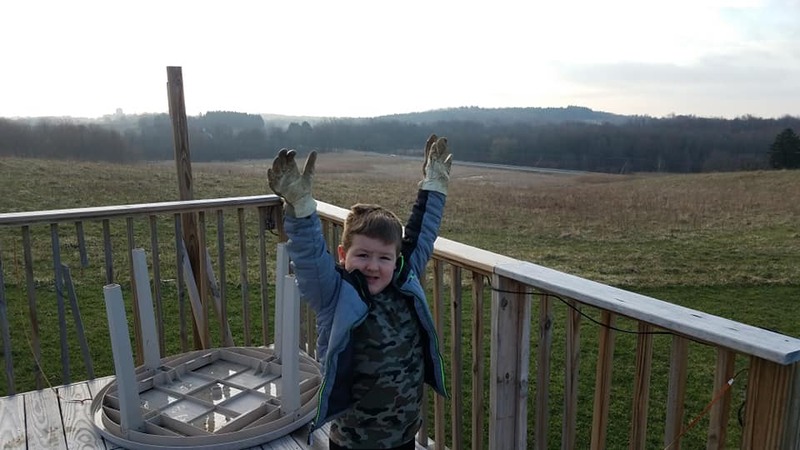 We lost a large percentage of our new plantings. So I planted even more! Now, we’re faced with the challenge of pulling weeds. Even though we plant on plastic, the weeds are everywhere. We will be ready for an open house this summer, we just need a little break to recover from all the excitement around here the past month. Maybe we need to just stop and smell …the Lavender. Yes, we have 5 kids as of now. Eating 4 times each day, at ages 12 and 6. Their mom’s are milked twice a day, at 6. No breaks it seems in the foreseeable future, and certainly not during milking time. Genka and Geneva are finally working into a bit of a schedule. Genka’ s milking great, but Geneva’s holding back a little. We’re getting a combined total of about 1 gallon per day. The kids are consuming more than that, so we are mixing with milk replacer. 40 oz/day for the twins, and 32 oz per day for the others. Some of the comments on the internet say replacer can be an issue, so far, so good for us. We are very strict with our formula, and rationing the feeding, and it’s working. It get’s crazy with 5 kids all trying to eat at once if you are feeding them by yourself. Using the replacer, we are getting some milk for ourselves and are storing it. Our soaps will now include their milk from the farm. Their horns were removed last week, and Marc get’s banded in a few months. Sorry about that Marc, no other choice since we want to keep you. Yes, we’ve been busy and blessed with 5 new kids! 4 girls and one boy. Moms are doing well also. Maybe we can get some sleep soon. Our plans for once a day milking and raising kids “naturally” have gone. They would not have made it. 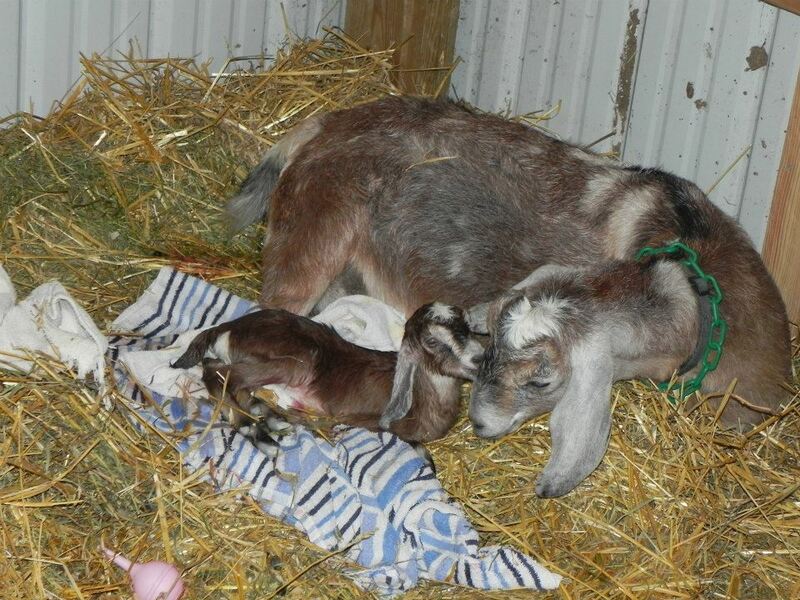 Genka started into labor at about 10 PM. The coldest night of the spring. It was freezing in the barn. We were hoping it would be an easier start for us since Genka was much smaller than Geneva, who was due in 2 days. We called the vet after a disconcerting bloody discharge, and waited for a more typical start of labor. After about 4 hours, with a normal presentation, she delivered a 3.2 pound weakling that wasn’t breathing. As I’m trying to revive her, she drops 2 more very small kids in fairly quick successon and Connie and I have our hands full. Ken continued working on the smallest triplet who was non-responsive, and finally she begins to respond. 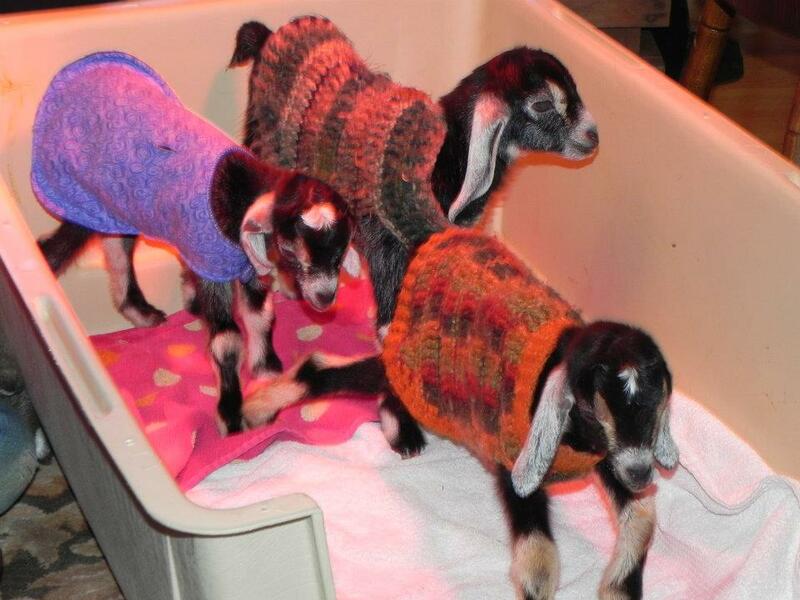 After about an hour of trying to convince ourselves that something is wrong with Genka and her weak babies, we call our friend Mark, who comes with goat sweaters, and a jug of collostrum. Shortly after Mark arrives we call the vet and Genka “delivers” an unformed fetus and goes into shock. It was just too much for a first time mother. Our vet is a great asset. House calls, and early in the morning? No problem. He helps Genka get stabilized, gives the kids some shots, and then says ” don’t name the kids”. We’ve got 3 small doelings in our hands. The kids have to go into the house to keep warm, the mom was not interested in them at all, and had no more colostrum/milk to give. We nurse them to relative health and then Geneva shows signs of labor. Geneva’s labor, on the other hand, went pretty much by the book. Some friends and my sister stopped over to wait with us. Geneva finally started to deliver and sure enough, seems like she is in deep trouble, with an assist required by Connie. She then goes on delivers two beautiful and healthy kids. A boy and a girl. Geneva seemed kind of interested in her twins, she had no colostrum, and we were trying to decide whether to leave them in the barn with Geneva, or take them in the house with the triplets and feed them some colostrum that we have milked out from Genka earlier. Well, the house it is. Our hope for dam raised kids is gone for now and we have a full house on our hands. We can’t help but wonder where this woudl have ended up on a large dairy farm or “in nature”. Would a first time freshener like Genka made it? Would Violet, the first triplet, have had any chance? 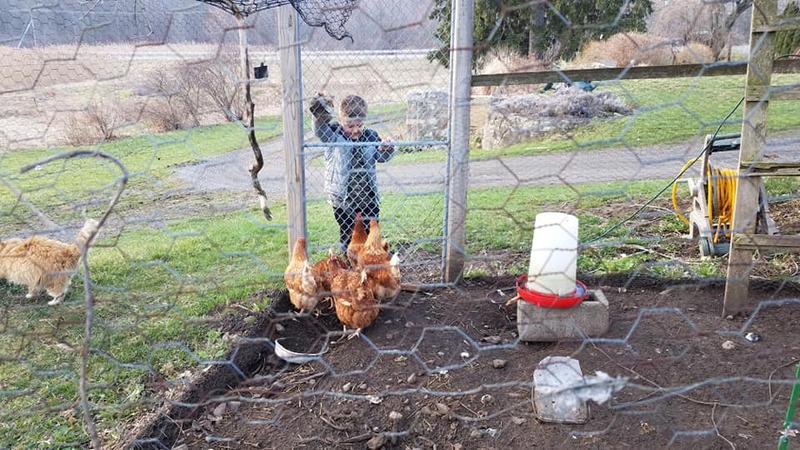 Could the farmer invest the time and money to nurse along week kids and mother? Would that have taken time and talents away from the rest of the herd? Would “natural selection have resulted in the death of a least 2 kids and potentially one mother. Perhaps dairy farming has interrupted this process and allowed for selection based upon other factors. Was Genka highly desired for her ability to give 3 kid girls at a young age, or would she be selected out of the herd as a problem?